UCONN DINING IS GLUTEN FRIENDLY! 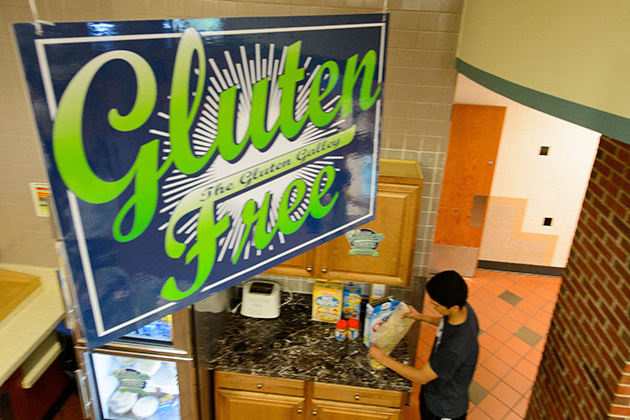 As the demand for gluten free foods is steadily increasing, UConn Dining Services stands ready to meet that demand. In 2001, UConn met with its first two students on our meal plan who were newly diagnosed with celiac disease. By 2013 – 2013, we were accommodating over 200 students and community members needing gluten free diets. Why such an increase? 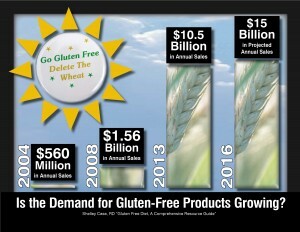 Increased recognition of the signs and symptoms of celiac disease/gluten sensitivity and quicker diagnosis by doctors. For two years in a row, 2014 and 2015, UConn is ranked #1 for the gluten friendly options offered through Dining Services. 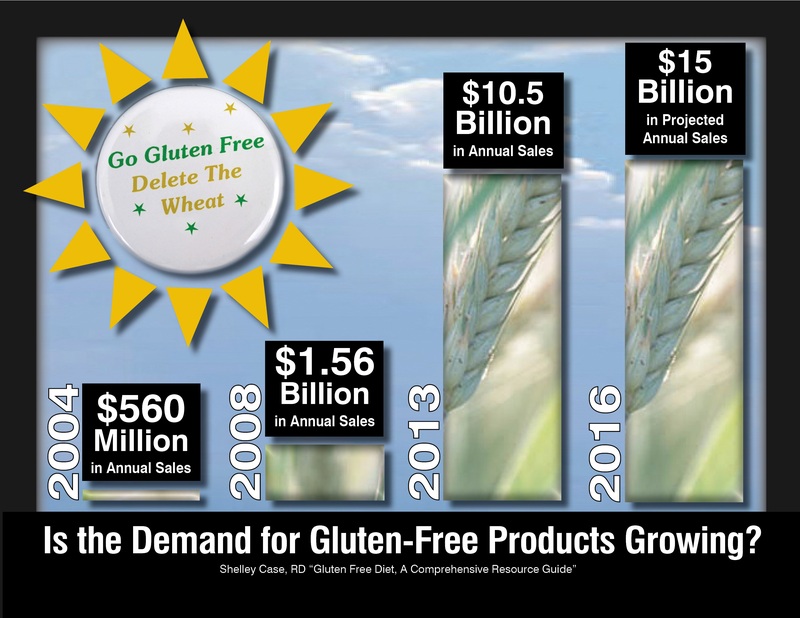 The list of the Top 10 Gluten Free Accommodating Colleges for 2014 was announced July 11 at the 2014 meeting of the National Association of College and University Food Services. “What set you … apart was that you went above and beyond the call of duty in providing gluten-free options for your students and truly helped them thrive,” said a letter informing the University of the ranking. Dining Services’ goals include providing flexible dining programs that provide value, support the needs of students, and enhance the education experience; maintaining student wellness through good nutrition; meeting the dining needs of a diverse population; and maintaining consideration for the environment. 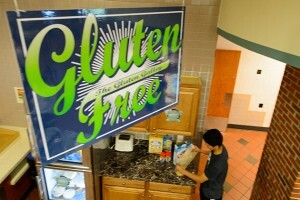 What Do We Do When a Student Needs a Gluten Free Diet at UConn? One-on-One Meetings: If you must follow a gluten free diet, Dining Services is available to meet with you one-on-one to plan your special dietary needs. If you have concerns about your special dietary needs, schedule a meeting with our Dining Services team. Typically, our team is made up the Assistant Director of Dining Operations, a dining unit area Manager and Production Chef from the dining unit that you will eat at most often, along with the Registered Dietitian on campus, and the Manager of Culinary Development. This meeting gives everyone a chance to meet and converse one-on-one with you about your specific needs and explain how we can best accommodate them. UConn Dining Services provides a range of dining options to meet students’ dietary needs, including gluten friendly and kosher offerings. Each of UConn’s eight residential dining units at the Storrs campus has a special gluten-free area that stocks strictly gluten-free foods; the USM Food Court also has a complete gluten friendly menu in each of it’s five food stations, One Plate, Two Plates, also in the Student Union, has a significant gluten friendly menu. In our dining units, it is of utmost importance to label foods clearly and in plain sight at all food stations and on each serving line. Each dish is displayed in the case with a legible sign stating the name of the item, the calorie/protein/carbohydrate/fat content of the dish, and a list of any of the top eight allergens it contains (i.e., wheat, dairy, soy, egg, fish, shellfish, peanuts, tree nuts.) In addition, the labels specify “gluten” if an item has wheat, barley or rye or if there’s a possibility of cross-contamination. The feedback we’ve received from students is that this is one of the most helpful and important tools they use daily to find safe choices throughout the dining facilities. The University of Connecticut Department of Dining Services makes every attempt to identify ingredients that may cause allergic reactions for those with food allergies. Every effort is made to instruct our food production staff on the severity of food allergies. In addition, we label items with possible allergen-containing ingredients; however, there is always a risk of contamination. There is also a possibility that manufacturers of the commercial foods we use could change the formulation or substitute at any time, without notice. For items labeled gluten friendly, the manufacturer ingredient labels have been reviewed and some do not contain a certified gluten-free seal. Customers concerned with food allergies need to be aware of this risk. Dining Services also operates its own bakery. Our bakery is not a nut free bakery. We cannot guarantee the absence of cross contamination with our baked goods. The University of Connecticut Department of Dining Services will not assume any liability for adverse reactions to foods consumed, or items one may come in contact with while eating at any University establishments. Students with food allergies are encouraged to contact Dining Services at 860-486-3128 for additional information and/or support. Also go to dietary restrictions information page. We have our very own gluten free bakery. This bakery bakes delicious baked goods every day which are then sent to all of the dining units and cafes. You may also order gluten free items directly from the bakery. Check out the website for information. With the rate of allergies and sensitivities on the increase, more and more colleges are going to have to make the necessary changes to meet the needs of special-diet students. UConn Dining Services is ready to meet that challenge to provide you with a safe, nutritious and enjoyable college dining experience. As always, we invite your feedback. If you have comments or suggestions concerning our menu, please call the Dining Services main office at 860-486-3128.